This is an extended version of the CW Thought and Action article from the 2017 Round Table: (Dis)Placement . Voluntary poverty is expressed in a million ways throughout the Catholic Worker movement. From rural projects developing alternative clothes-washing techniques to urban Catholic Workers who rely on bicycles for transportation to small-town communities that do economic sharing, practices of voluntary poverty tend to be creative experiments in truth. One of the hallmarks of Catholic Worker philosophy, voluntary poverty is rooted in the early Christian Church practice of possessions being held in common, freeing up individuals to be more available to the community. Dorothy Day said, “We must keep on talking about voluntary poverty, and holy poverty, because it is only if we can consent to strip ourselves that we can put on Christ. It is only if we love poverty that we are going to have the means to help others. It we love poverty we will be free to give up a job, to speak when we feel it would be wrong to be silent. We can only talk about voluntary poverty because we believe Christians must be fools for Christ.” The Catholic Worker Aims and Means states that, “’By embracing voluntary poverty, that is, by casting our lot freely with those whose impoverishment is not a choice, we would ask for the grace to abandon ourselves to the love of God. It would put us on the path to incarnate the Church’s ‘preferential option for the poor.’” Many folks consider voluntary poverty to be a sort of spiritual practice, essential to their identities as Catholic Workers. The deep purpose of voluntary poverty involves forming right relationships towards each other, and toward the planet; sharing what resources we have, and taking what we need. Voluntary poverty is resisting the materialism that pervades our society. It’s defying the tropes of capitalism that say that we need to produce (whether it is money, volunteer hours or number of meals) to be worthy. It aims to enable people to be more available to seek justice. 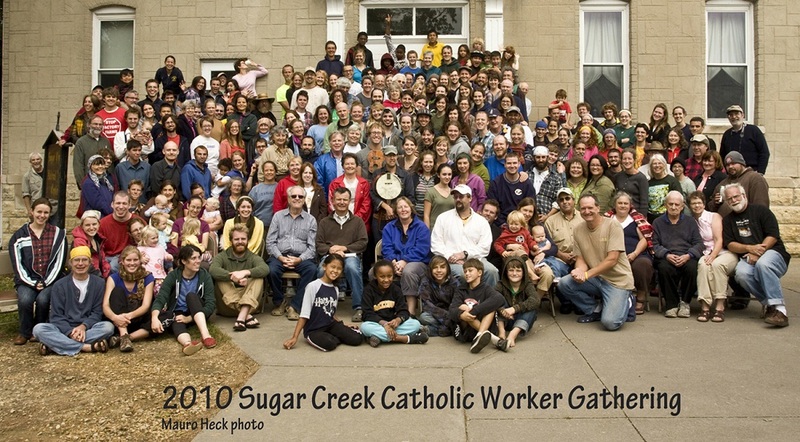 Looking at voluntary poverty through an anti-oppression lens, it’s important to acknowledge that presently, the Catholic Worker movement is an almost exclusively white space, and in terms of class, the majority of it’s members are raised middle class. Many of my comments will be geared toward folks with these identities, and I welcome feedback on this article, which is rooted in my experiences as white, middle class, long-term Catholic Worker. This is not meant to ignore the people of color that have always been part of the movement, or for the poor and working class people who identify as Catholic Workers, rather, it’s an attempt to call in folks with similar privileged identities. I’ll start with a few observations from my experience. I have often experienced the practice of voluntary poverty embodying a white savior complex. In our writings on voluntary poverty, we Catholic Workers can often appear messianic, alluding to our steps to save the planet, provide light in the dark, and a voice for the voiceless. The white savior complex manifests when concepts like morality become racialized as identifiable with white people over non-white people. I see this happening when our CW lifestyle of voluntary poverty and the Works of Mercy are considered unique, angelic and fundable. I know many poor folks and people of color doing these same practices who don’t receive nearly the same level of recognition or support. In my experience, the precarity that Dorothy promoted is simply not good for human psychology or for people to live full lives. I believe it feeds into a trope of martyrdom and scarcity that actually feeds into unhealthy patterns and relationships. Precarity keeps us from feeling at home and stable. It prevents us from making goals for ourselves because we are constantly struggling with short term crisis-oriented things. While that quote from Dorothy about “stripping ourselves” above may feel liberating for middle and upper class folks, in my experience, it is disinviting to both people of color and working class folks. For example, when I’ve talked to guests about voluntary poverty using these quotes, it’s often felt more like a wall between us (“You aren’t getting health insurance, why again?”) than a doorway to deeper relationship. 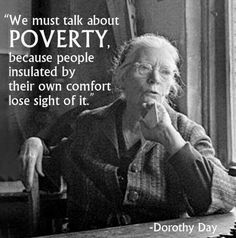 Dorothy Day often stated that by adopting voluntary poverty, “we” (Catholic Workers assumed to not be involuntarily poor) will be able to love better and share a deeper life with the guests. During my time at Karen House, I have never felt like this was deeply honest. In some ways, it propagated this internal myth that I was “the same” as the guests, actually getting in the way of relationship, and ignoring my structural race and class privilege. Many practices of voluntary poverty can feel like volun-tourism, where white, middle class folks spend lots of time on low-risk, individually-oriented experiments with the latest fads of fermenting, thrift store shopping and biking, and don’t seek out developing new skills of communication, conflict, and vulnerability that will help them share a deeper life with others. Having witnessed some powerful connections between guests and volunteers who did not adopt voluntary poverty, I’m not sure that my lifestyle of voluntary poverty actually provided more connection, intimacy, or vulnerability in my relationships with the guests. Some of the root goals of voluntary poverty are creating right relationship, and freeing people to do justice and live their best lives. Within the varying contexts and current demographic of the Catholic Worker, what practices can lead us there? I can offer a few ideas here, which are just a start. The economy of the U.S. has always relied on the invention of race and racism to extract labor and resources from communities of color and funnel them towards businesses and organizations that are identified with, and led by white people. The Catholic Worker is not an exception to this; in fact, the statement issued by the 2017 CW Midwest Faith and Resistance Retreat acknowledged that the Catholic Worker’s access to resources and power “indicate less that our work is righteous and more that we live in a world where…. white people like to invest their wealth in white-led organizations.” Recognizing this reality, white Catholic Workers, and white-dominated CW communities need to ask, “What can we do to return what has been stolen from people of color and Native people?” This is about reparations on both an individual and a community organization level, again, while taking our different identities into account. Whiteness provides privileged relationships to loans, land, and education. How can our community work to shift money and resources towards organizations led by people of color? How can I as a white person set up sustainable practices that move resources to individual people of color? What material support can I and my community lend to grassroots groups led by people of color (money, child care, errand running, background support)? What could accountability to these groups look like? In terms of underlying expectations and community culture, we need to examine the ways that the CW practice of voluntary poverty can manifest white supremacy culture; for example, perfectionism, competitiveness, individualism and either-or thinking. Check out the end of this article for some examples. We may need to create new language entirely in order to move away from strong ways that our voluntary poverty embodies white supremacy culture. I’ve heard “radical simplicity” suggested as an alternative. White-dominated communities need to wrestle with these questions related to whiteness that prevent right relationship. In what ways is our community’s presence a manifestation of colonialism? In what ways are we taking resources from the local community or taking resources away from other groups led by people of color? In what ways are we contributing to gentrification by importing white faces into communities of color? Voluntary poverty is rooted in some powerful intentions. The way that it is currently practiced by a majority white, middle class movement of people manifests some problematic and exclusive tendencies that hijack our work toward equity and justice. I’ve spent my whole adult life in the Catholic Worker, and hope that we can evolve to become a more inclusive and welcoming space. Unless the Catholic Worker movement reckons with how we preach and practice voluntary poverty, we will remain a space that largely excludes people who aren’t white and middle class. “White Supremacy Culture” is a powerful article from white anti-racist educator Tema Okun listing some of ways the belief system of white supremacy can inadvertently show up in behaviors and organizations. White people may not even realize there is such a thing as white culture or tendencies, because they are like the air we breathe — invisible, and taken for granted by white folks as the only way to be. But this culture is often felt by people of color, and experienced as racism. We think of culture as the way of life of a particular group including the behaviors, beliefs, values, and symbols that they accept (generally without thinking about them). 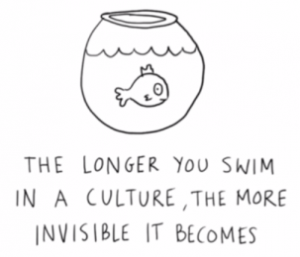 Culture is powerful precisely because it is affects everything, but from an underlying level. White supremacy culture is when the norms, values, ​beliefs and standards of white folks are considered normal, and good, while other ways are considered other, marginal, or inferior. Without personal and organizational work, most white-dominated organizations will end up embodying many of the characteristics of white supremacy culture, regardless of their radical or progressive intentions and philosophies. The Catholic Worker is not an exception. Here’s a few characteristics adapted from the longer White Supremacy Culture article with some ways that they interact with Catholic Worker practice of voluntary poverty. Perfectionism: Making a mistake is confused with being a mistake, doing wrong equals being wrong. There is little appreciation for successes in a perfectionistic community; folks mostly point out each other’s failures behind their backs. This is related to individualism, and is the opposite of collaboration. In terms of voluntary poverty, the communal standard can provide a litmus test on whether people will feel a sense of belonging. In community, perfectionism often looks like an emphasis on personal purity over collective (flawed) engagement. Antidotes to Perfectionism: Develop a culture of appreciation for people’s efforts, emphasize collective integrity over individual purity. In a regular, structured way, create communal time to appreciate people’s work and efforts. Develop a community culture that learns from mistakes and values vulnerability. Commit to learning HOW to share better, rather than expecting people to arrive with the necessary skills. Regularly, communally, ask about different aspects of Catholic Worker philosophy, but particularly voluntary poverty: in what ways does our community culture embody perfectionism? Sense of Urgency: We need to embrace voluntary poverty NOW, in THIS SPECIFIC WAY. The sense of urgency makes it difficult to be inclusive and encourage thoughtful decision-making (especially around the fact that people have different class identities). It also deters us from considering the long-term repercussions of our actions, many of which (like resisting student loan debt) can have lifetime consequences. A sense of urgency frequently results in over-valuing quick or highly visible actions that may be “performative” rather than relationship building or transformative. These types of actions rarely manifest into longer-term practices after the person has left the Catholic Worker. Antidotes to Urgency: Build in a spacious amount of time for thoughtful planning. Embrace people’s different interpretations and practices of voluntary poverty. Acknowledge that different class and race backgrounds will affect people’s experience of voluntary poverty. Treat the commitment to right relationship with community, guests and the planet (the root of the voluntary poverty concept) as a life-time journey that evolves rather than a box to check off. Regularly, communally, ask: in what ways does our community culture around voluntary poverty and radical simplicity feel overly urgent? Quantity Over Quality: We over emphasize voluntary poverty in terms of material possessions and amount of things, and under emphasize relationship building and process. Things that can be measured (pounds of trash saved, amount of electricity saved, pounds of produce grown) are more highly valued than things that cannot (relationships in the community, process of decision-making, ability to constructively deal with conflict). Antidotes to Quantity over Quality: Include process or quality goals in your planning; make sure your community has a values statement which expresses the ways in which you want to do your work; make sure this is a living document and that people are using it in their day to day work. Create a culture that focuses on the root aims of voluntary poverty rather than policing physical results. Regularly, communally, ask: how are we building each other up and growing in love in our practice of voluntary poverty and radical simplicity? Either/Or Thinking: You’re either the Catholic Worker who cares about the poor and the environment, or you’re not. This can be related to white savior model and Catholic guilt – you are either in this martyr-model with us, or you’re part of the problem. There is no sense that things can be both/and, and very little thought into how people’s different identities impact their interpretation of voluntary poverty. Can be used to manipulate people into following a specific agenda, with no time or encouragement to consider alternatives. Antidotes to Either/Or: Notice when this is happening and try to present both-and concepts. Name unspoken expectations about voluntary poverty, resource use, and behavior. Value creativity. Create a community culture of flexibility and a welcome for many paths leading to the same goals. Individualism: “Who can consume the least, grow the most or dumpster-dive the most?” Voluntary poverty can be such an individualistic practice that feels more competitive than collaborative. Personal choices are valued over systemic change, with people and communities overly focused on individual purity over mass movement work. This can lead to isolation; if you can’t “take it” (because of physical health, economic reasons, whatever), you risk not belonging to the group. Antidotes to Individualism: Make people accountable as a group rather than as individuals to encourage collaboration. Create a culture where people bring struggles to the group. Acknowledge that no one is pure, and that we are all responsible for each other. Explore the role of privilege in how people practice voluntary poverty. Ask: In what ways is our community a part of the larger neighborhood and community? In what ways is our community accountable to the people where they live?